I'm always looking for new cool things to try in my classroom to keep me on my toes and keep kids excited about what might be coming next! I'm getting ready to start a big project with 6th grade and needed a quick mini lesson that would give them some experience with CelluClay. If you've never used this stuff, you're missing out. It brings together the best parts of clay and paper mache: it's easily manipulated, it sticks to itself and almost every other surface imaginable, you can shape it into just about anything you can dream up, and it dries sturdy and ready for paint within a day or 3 (depending on the thickness of what you make). The best part? No kiln needed, and kids still walk out of the art room with a durable, lasting, memorable piece they'll love. For my quick mini lesson I decided to look in the cupboards to see what we could use as an armature under the CelluClay to give it shape and stretch my product. Folks donate all kinds of neato things to my art room and I happily hoard them just in case. You know, just in case it might be useful one day. I happened upon quite a stash of these tiny plastic cups in my cupboard and an idea hit me. We could use these to make little finger puppets. I thought of a coworker who's related to someone who collects little finger puppet heads. Still with me? Good. I've made little finger puppets with this coworker before to make personalized gifts for their relative but we've always used traditional clay. They were always whimsical people, and because they were clay they had to dry for days, bisque fire in the kiln, then they needed to be glazed and fired again. It's time consuming. CelluClay cuts all of those extra steps down and simplifies the process. After students had their messy mats ready to go and names/class sections were written on cups, I walked around the room and gave each student a handful of CelluClay. I showed them how to smooth it over the surface (you can read about mixing it up and how to apply it here, which also explains why we are doing this mini lesson). They set to work making an animal finger puppet, choosing whatever animal they wished! For those not really feelin the animal finger puppet vibe, they had the option of making a tiny planter. Those students did not cover the bottom of the cups (we'll be poking a tiny hole in the bottom for drainage and any water coming out could be a gross mix with the paper mache clay later). Folks making planters added funny faces, dots, lines, and fancied them up any way they wished! Once completed, they placed them in a copy paper box lid lined with wax paper (to prevent them from sticking to the lid). The next time we meet students will use acrylics to paint their pieces. I made a bear and decided not to make it look traditional. I was feelin a bit more Lisa Frank funky today and kids LOVED it! Once dry I added texture details with black and silver Sharpies. We'll document our work to share on Instagram @ashcanworks so be sure to check them out! 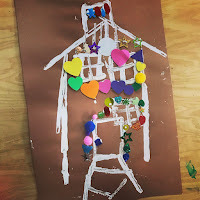 This morning I had 10 seconed grade cuties join me for AR reading points free art time! 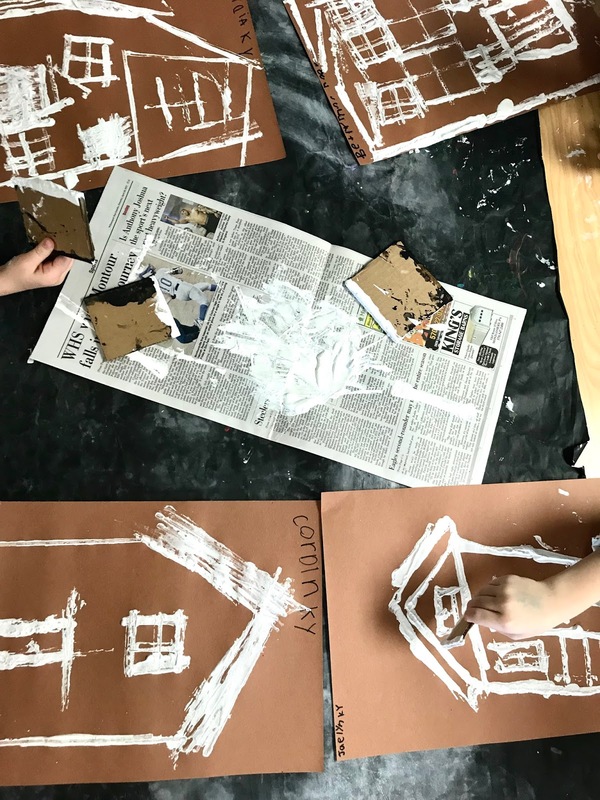 We used some leftover CelluClay to make animal finger puppets and they LOVED it! I've only tried these with 2nd graders and 6th graders, but this stuff is a fan fav. If you try it out, share pics! 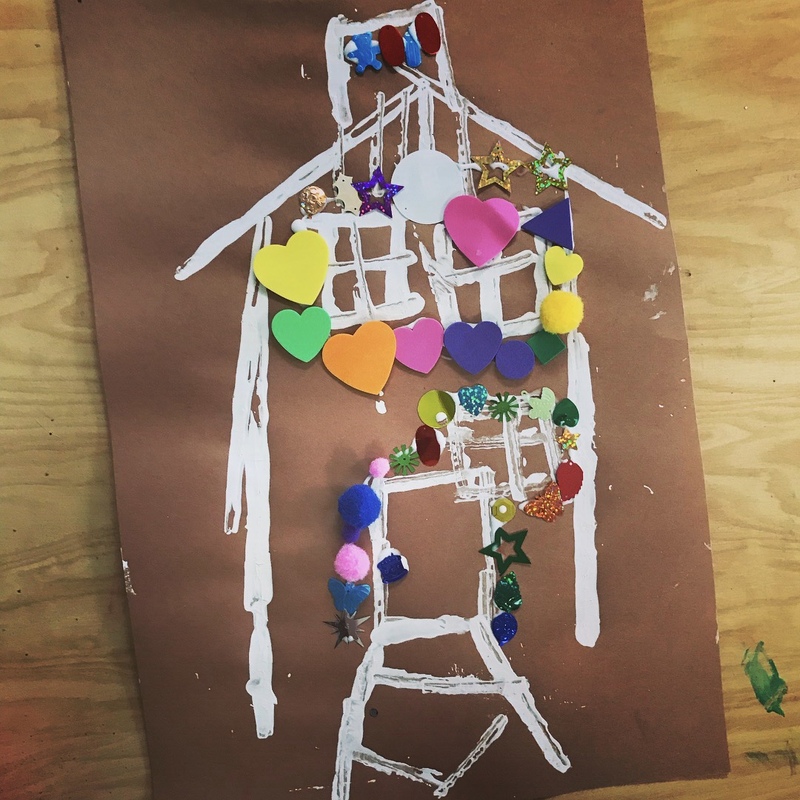 We love to see how ideas inspire others! Kindergarten has been working really really hard all year learning about lines. We know different types of lines, we know how to draw those lines (those spirals are tricky!). We can turn those lines into parts of a landscape (zig-zag mountains, curvy hills, dotted roads, you name it! ), we can even use lines to make a whole bunch of funky patterns! Whew! That's a lot of stuff! To add to what we know about lines we learned that when you overlap them they make shapes. Yep. We can overlap lines to make shapes. Ever played tic-tac-toe? That's a shape in the middle of that hashtag board you drew. We learned about an artist famous for overlapping lines to make shapes: Mondrian. Take a minute to check out his work if you aren't familiar with it. Kindergarten felt pretty confident that they could overlap lines too, so we thought we'd try this out! We viewed and discussed Mondrian works, chatting about how big and small some of his shapes were. Then we played Line Simon Says! Everyone pushed in their chairs, stood behind them, made sure they had room to move a bit, and then we were ready to roll! For vertical lines we stretched waaaaaay up, reaching our hands as high as we could. We even stood on tippy toes! Those lines were tall y'all! Horizontal lines were arms stretched straight out on both sides. Diagonal lines were tilted to each side. It helps to make airplane noises when you're tilting, of course. We're especially good at those diagonals. After all those stretches, we were ready to get started on our Gingerbread Houses! 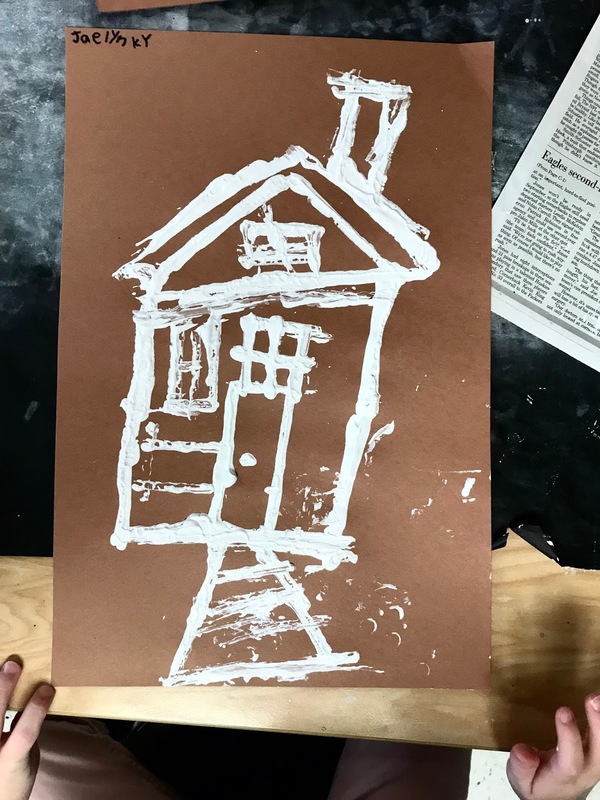 Students used pieces of cardboard dipped in white tempera paint to print lines of various sizes on their brown construction paper. 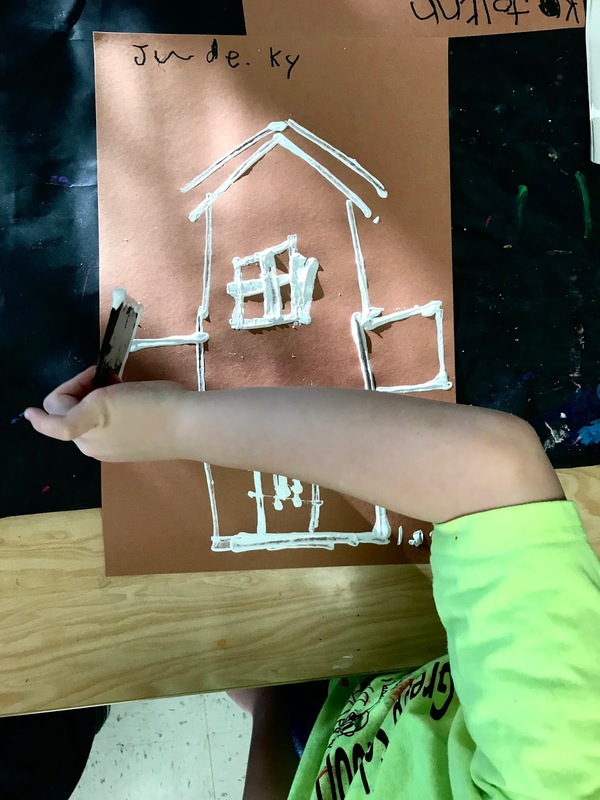 I projected examples of gingerbread houses so they could look at a variety of features while designing their own, taking their favorite parts of things we discussed and trying it out. 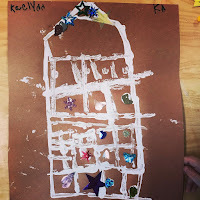 We used directional lines and overlapping lines to be gingerbread house architects! 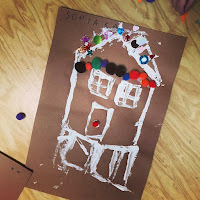 The next time we had art together our pictures were dry and we were so proud of the work we did! After reviewing our directional lines with some Line Simon Says we set to work exploring a variety of textures to embellish our gingerbread houses! THIS WAS SO EXCITING! While students worked I projected examples of actual gingerbread houses so they could see parts that typically have candies on them. After a quick demo on how to use glue, they were ready to dive in! 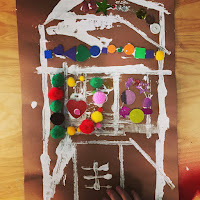 Students showed their friends awesome sequins they found, they talked about colors and textures they liked. So many giggles, smiles, squeals of delight! 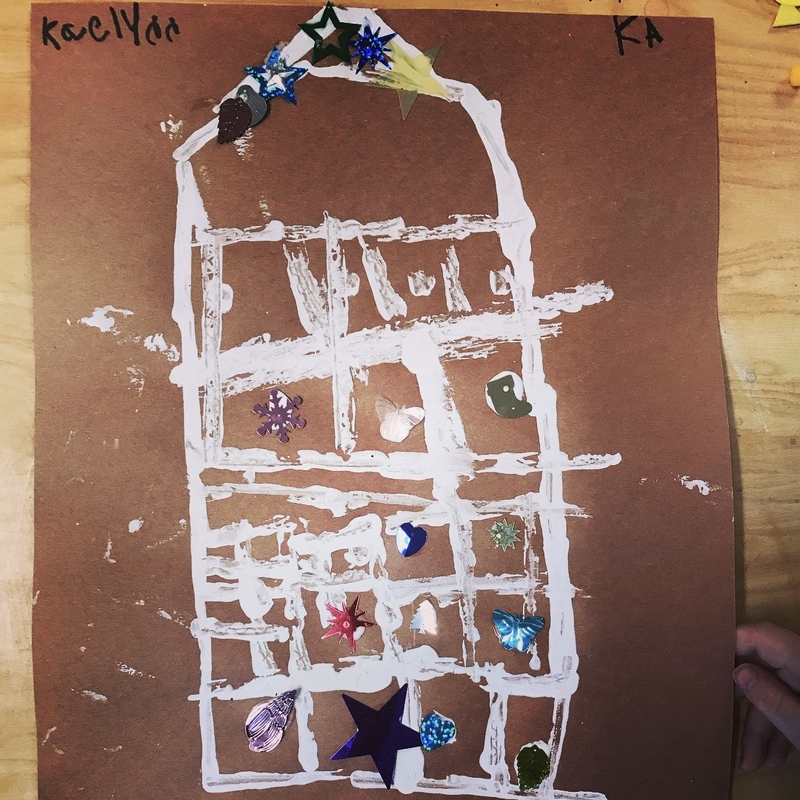 Kindergarten did a truly FABULOUS job designing gingerbread houses! We wrapped things up by reading this fantastic book about shapes. Stay tuned! The shape adventure continues! Each year for the past few years my husband and I have traveled to Found in Ithaca, NY for our anniversary. Found is an antique shop with all kinds of fun goodies to drool over, but once a month throughout the warmer months they host an outdoor flea market in the parking lot. IT'S AWESOME! Our children, who share our love of fun finds, tagged along and we challenged them to find something cool for $1 or less. Challenge accepted! If I could live as an American Picker I totally would in a heartbeat. My husband and I would live happily ever after as hoarders of treasures that delight the eyes! Alas, it's not a realistic option, so we go on occasional hunts for fun. While visiting booths and handling wares my daughter fell in love with an adorable hand hooked stool, but the price tag was too steep for the budget of the day. To her delight, we found a similar stool at another flea market for a steal! I found a cute little wool rug for our new house. It'll work nicely with our funky eclectic style. Randy always looks through the boxes of art at flea markets. His patient search paid off! Of all the art in all the boxes of the day he walked away with this little piece. The scene is very much like the view from our new front porch and the colors are a perfect compliment to art pieces we already have. The blues will pop nicely on our freshly painted yellow walls, adding to the cozy vibe as we make this new place our home. My son aspires to be both a hippie (in a generic sense) and a mountain man. He's 11, so he's got plenty of time to work on developing his life plan. In the meantime he pretends to hike the Appalachian Trail around our yard and is reluctant to cut his hair. The artist who made this looked very much like the face emerging from this black walnut shell ring, and Matt loves it. I do too! Our children found this little ceramic gum saver as their $1 find for the day! They agree that the idea of saving your gum is gross, but the novelty of it won them over and it now holds tiny treasures on a dresser. We each walked away from the adventure with a new home finds and a smile! Last spring a group of coworkers decided that hiking the Appalachian Trail was on their bucket lists. Determined to go, and inviting me to join, we researched what we needed and made a plan! This year all of us felt a little as though we were forgetting something important- thankfully we weren't! The major difference was that last year it was all brand new and it required a lot more planning, reading, and researching. We researched equipment, maps, food, clothing, and picked the brains of folks who had hiked it. We learned as much as we could before getting our feet muddy. You can read all about it here. Prep this year was waaaaaaaay easier. I knew how to prep the clothes I already had to prevent ticks and pests from bothering me. I could base what foods to pack and how much I needed on notes from last year. I was ready to air out my tent for waterproofing. Yeah! I could do this! WE were DOING this! Again! Food packing looked like this. 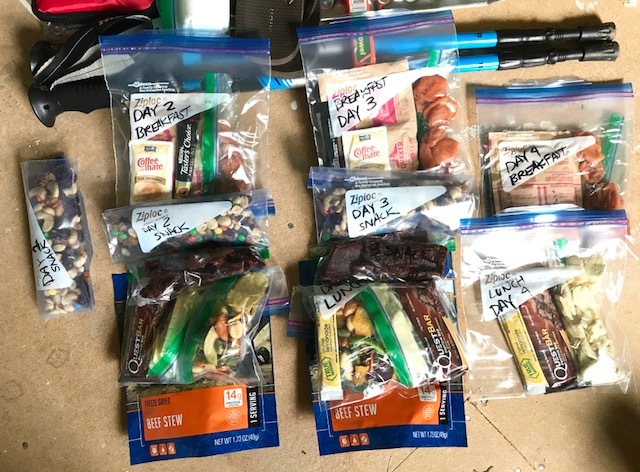 Each meal was labeled in a bag and put into a larger one labeled "DAY 1", and so on. This kept things tidy in my pack and easy to get to when I need it. The goal was to have enough calories and protein without the food itself weighing too much. With home renovations making messes all around me, it felt good to have something tidy and controlled for a change. I laid everything out to make sure I had all I needed and to see what I could possibly leave behind. Every single thing packed adds weight, and those tiny little comforts add up quickly. I read "The Ultimate Hiker's Gear Guide" by Andrew Skurka last year, and skimmed bits of it as a refresher this year as I prepped to pack. It was extremely helpful in my prepping, purchasing, and packing. We set out by car at 4:30am! My pack weighed roughly 29 lbs this year, very close to last years weight. It's not ideal, but for me there are comforts that are worth the weight to carry. Last year we hiked from Palmerton, Pa. to Eckville. It was tiring, it was difficult, but in the end we felt accomplished. This year we picked up where we left off and hiked 43 miles to Bethel. On our first day we ate our lunches at Pinnacle Rock in Hamburg. We met a lady lunching there, airing her feet, socks and shoes as she lunched as well. We are always intrigued by what inspires folks we meet to start on this journey. She shared that she quit her job to test out a possible new business venture, making her own ultralight meals for backpackers. What better place to test out such an idea than the AT?! She's a "flip flop thru hiker". These hikers begin their journey at the midpoint of the entire trail in Harpers Ferry, WV. They travel north or south to the end, then return to the midpoint and hike in the other direction, eventually hiking the entire Appalachian Trail. The Pennsylvania portion of the AT is known for its rocky terrain. When you tell hikers you meet on the trail that you began your AT adventure in Pennsylvania they are genuinely surprised that anyone would choose such a difficult stretch as a starting point. As "section hikers", we attempt to hike small bits of the trail each year. It made the most sense for us to stay close to home, especially since none of us had ever done it before! Hiking is hard, smelly, and often uncomfortable. Once you accept that that's how it's going to be for awhile, you can focus on the positive. There are beautiful things everywhere around you. The trail you're hiking changes quickly from mud to rocks to boulders and back again. The woods you pass through change from thick and full to low and covered in ferns. Last year water sources weren't reliable and we were thirsty. Thankfully this year we found several streams to refill our water bottles in! When terrain gets extra rocky you walk with your eyes to the ground for safety. While walking I often look for heart shaped rocks and puddles because it makes me think of people I love. My husband loves fonts, old things, and metal. I thought of him when I saw this on the trail. We hiked through a controlled burn area. Everything low was black and charred. You can see the burn date was from May of this year and already green was reclaiming the forest floor. When you chat with other hikers they often warn you of what is ahead of you- lots of rocks, beware of snakes, no water for so many miles, etc. One hiker told us to look forward to some "trail magic" and shared that a man living close to the trail would let you stay at his cabin for $5 a night. He'd feed you, you could shower, and it was awesome! We weren't interested in hiking 2 miles out of the way for this, but for those on the trail for days longer than our trip it was a pretty big deal. "Trail magic" is an unexpected act of kindness that helps hikers in their journey. Several miles after hearing about trail magic we found this! The cabin man we'd heard about also leaves two coolers, one filled with water and the other with snacks (granola bars, hummus, cheeses, and Werther's Originial candies) on the edge of the trail for thru and section hikers only! Two garbage bags hung from trees to collect the trash hikers are packing out (you never litter when hiking, take out what you take into the woods). We didn't take anything, but we left with smiles. Such kind gestures truly do mean a great deal to hikers. We've set up camp in several "campsites" along the trail (the ground is flat and there's a makeshift fire pit), but this one was my favorite. It was spacious (most are very small). Water was close by. The trail went through the middle of the site. It was beautiful. After setting up tents it was time to build a fire and rest our feet! Not every evening ended with a warm fire. We had rain more than once that made fires difficult to make so the idea was often abandoned in favor of hot food and sleep. Our group included 7 people last year. We shared supplies, including cook sets. This year we hiked with just 4 people. Half of the group used a Jetboil portable cook set, and I shared my tiny Esbit set. The fuel is lighter and smellier, but it's perfect for my needs and pack weight. This is what's for dinner each night on the trail! I buy them at Walmart in a variety of meal options, but this is my favorite. During a cold and stormy night dinner in my tent I decided that the folks on the package definitely were not hiking the Appalachian Trail together. While dining I thought about the lady we'd met the first day at the Pinnacle. I follow her on Instagram and will be watching for her ultralight meals for hikers next year! Crawling out of a tent in the morning before the sun has time to warm things up isn't easy, even with the hope of a warm cup of coffee and some hot oatmeal for breakfast. ..... it makes it easier to get up and moving. We learned a lot our first year, and we learned even more our second. Already looking forward to the next adventure! Until then, I'm going to do my best to enjoy this summer! I'm Ashley McKee - elementary art teacher, wife & mom of two! Here you'll see what's happening in the art room, projects I'm working on, and follow my adventures! Drive Safely! all content copyright 2016 Ashley McKee. Simple theme. Powered by Blogger.